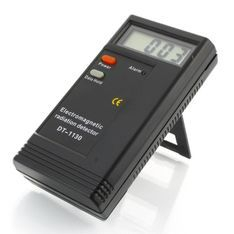 DT-1130 Portable Electromagnetic Radiation Detector - EMF Meter. Ideal for Paranormal Investigators and householders who want a simple to use portable or static EMF meter & alarm. Great for home use for those who are concerned about the harmful affects of high EMF within a house. 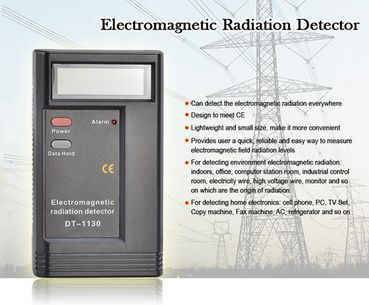 - 100% brand new and high quality electromagnetic radiation detector. - Designed to meet CE industrial standard. bedroom, office, computer room, control room, cable, power lines, monitors, transmitters and other sources of measurement. computers, televisions, copiers, fax machines, air conditioners and other power sources of test analysis. - Wide range of detectable frequency. - Comes with a built-in stand for convenient to put in on the table or other smooth surfaces. - Portable design, light weight, easy to use and convenient to carry. - Display readings: three semi-liquid crystal display with the maximum reading of 1999V/m. Easy and simple to use. One button operation On/Off.